In addition to the long-lived No. 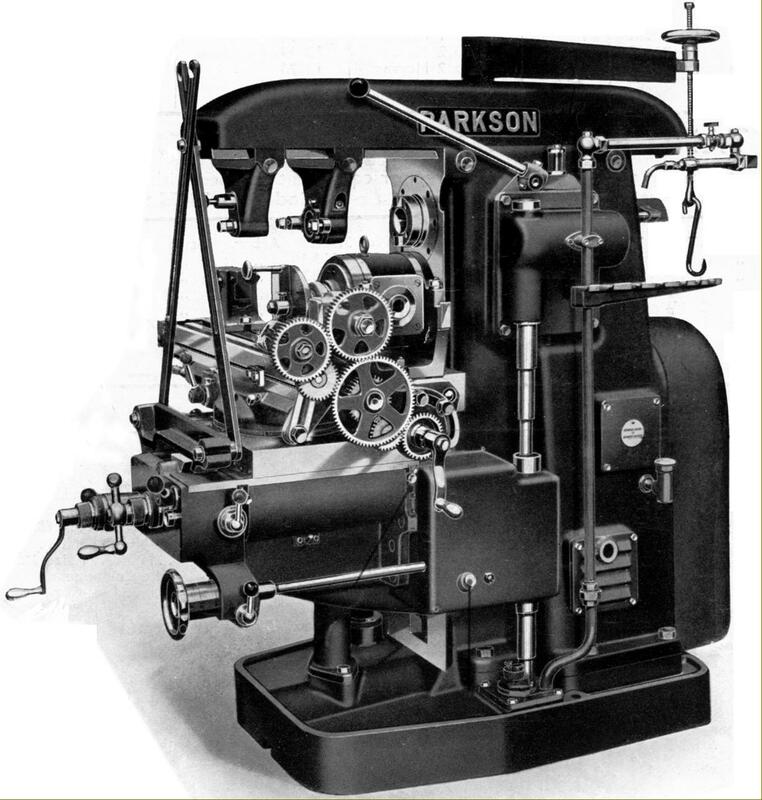 1 and No.1N machines, one of the most popular Parkson models - and a machine that found a world-wide market - was the No. 2. It was manufactured from the 1930s until the 1960s and, like the competing Cincinnati No. 2 MI miller, underwent a steady if unspectacular programme of development. It was sold as the 2Np Plain Horizontal, 2Nu Universal (with a swing table, a standard-fit 12" dividing head and a built-in crane for mounting accessories) and the 2Nv vertical. Identical in all respects - save for their tables - the early Plain and Universal models were designed to be driven by a 2.5-inch wide flat belt from either a 4 h.p. motor held on an adjustable platform within the column base, or (picking up on the 12-inch diameter input pulley) from line shafting. The drive passed though a lever-operated, multi-disc clutch with a brake that operated automatically as the drive was disengaged. Built into the column, the speed-change gearbox held gears and splined shafts that were hardened and ground, running on ball or roller bearings and lubricated by a pressure pump with a flow indicator on the right-hand face of the column. Hardened on its 50 INT nose, ground and supported in two precision taper-roller bearings at the front and a roller race at the back, the spindle had 12 speeds that ranged from 29 to 775 r.p.m. - a set that was adequately for the cutting tools then in use. Speeds were changed by the juxtaposition of two levers together with a rotary control - the latter with a speed-indicator plate - on the left-hand face of the column. 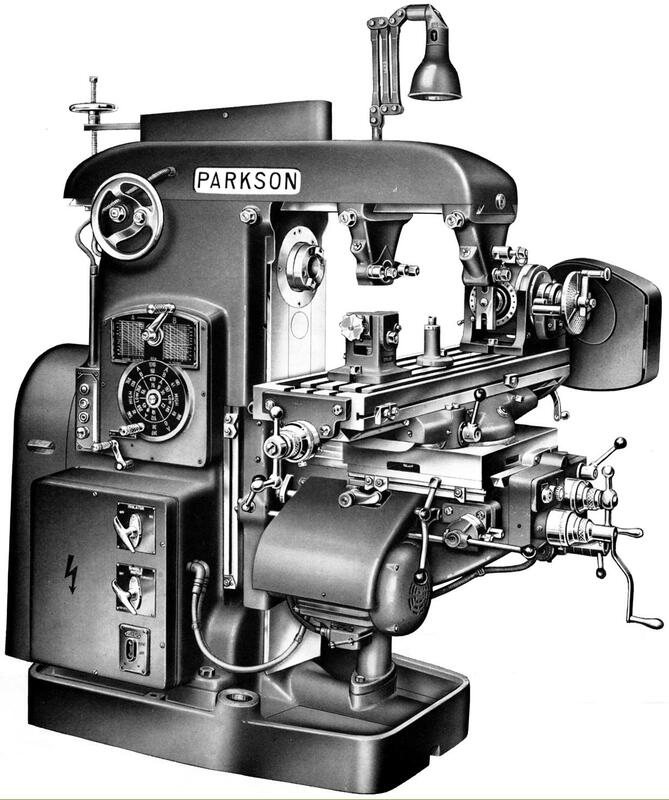 Instead of a single, start/stop lever that could be adjusted for position, the Parkson had two, with one mounted at each side of the column. Fitted to the Plain model was a 52.5" x 12" table, that on the Universal being 56" x 12.5" and able to be swung 50° each side of central. The longitudinal travel on both types was 28", across 10" and vertically 18" - with twelve rates of feed provided from 0.5" to 10.5" per minute for both horizontal movements and at one-half that rate vertically. The longitudinal feed was selected and engaged by a single directional lever on the left of the saddle while vertical and across movements used a single lever on the left of the knee for selection (lift for cross, press for vertical) and a separate lever, to the right of the right of the knee, to select direction. Rapids were fitted to all travels at the rate of 100" per minute for both horizontal movements and at 50" vertically. A single lever to the right-hand of the knee was used to engage the rapids; upon depressing it (and keeping it depressed) a contactor was closed, the power-feed clutch disengaged and the rapids safety friction clutch engaged. All feeds were driven from the main motor through a complex gearbox and drive-shaft system. In addition to the usual adjustable automatic knock-off stops on each axis of table travel, safety limit stops (and a mild steel 28-30 ton shear pin at the right-hand side of the knee bracket) were also included - ensuring that a careless operator could not wreck the machine by leaving a feed unattended. Part of the standard equipment fitted to the Universal model (and optional on the Plain) was a power-driven 12" Universal Dividing Head with a 1.125" spindle bore with a No. 10 Brown & Sharpe taper (the usual fitting for heads of this size). Able to hold just short of 26" between headstock and the lift-lower-swivel tailstock, the unit was fitted with a dividing plate on the nose for simple direct indexing when milling squares and hexagons, etc., and a double-sided index plate by which means all divisions up to 60 could be obtained as well as all even numbers and those divisible by 5 up to 120 and all common divisions up to 400. By using differential indexing, other divisions could also be obtained. The head sat on a reversible base plate, allowing it to be set at right-angles to the table, and could be swivelled from 5° below to 50° above horizontal so allowing spirals to be milled at any angle between the two settings. For milling spiral pitches with a lead of less than 0.1" the worm gear could be disengaged and the dividing head spindle connected to the table feedscrew by changewheels mounted on a quadrant arm - thus increasing the rate of rotation of the spindle in relation to the speed of table advance and so allowing very fine threads to be generated. Using the same knee, saddle, table and complete drive system as the Plain Horizontal model, the Vertical version of the Parkson No. 2 had a head secured to the column by four bolts and could be swivelled 50° either side of central; to ensure accuracy when reset to vertical after swivelling, the position was - very sensibly - located by retractable dowel pins. Inside the head was a massively built, large-diameter quill with 4 inches of travel under the control of a handwheel working through bevel gears and a rack. The No. 50 INT hardened spindle ran in two precision taper roller bearings behind the nose with a third roller bearing at the top. To control feeds, adjustable depth stops were fitted, together with a mounting for a dial-test indicator. 24 speeds were available, with a choice of three ranges all identical to those on the horizontal models: 18 to 1000, 24 to 1330 or 27 to 1500 r.p.m. Table feed and rapid rates were also the same - twelve feeds in both horizontal directions from 0.5 to 10.5 inches per minute and at half that rate vertically with rapids at 100 inches and 50 inches per minute respectively. While recognisably very similar to the earlier models and using identical controls, the No. 2 models produced from the late 1940s were significantly more powerful and able to take advantage of on-going improvements in cutting-tool technology. Fitted with a built-in 7.5 h.p. 1430 r.p .m. motor as standard, 24 spindle speeds were available with three (later four) Brammer link V-belts taking the drive from motor to the internally mounted column gearbox. On this model the clutch appears to have been omitted but the spindle brake, a Crofts Type S 'SB' Ortojust, was retained. The customer was given the choice three speed ranges: 18 to 1000, 24 to 1330 or 27 to 1500 r.p.m. Other significant improvements concerned the knee and its arrangement to provide feeds. Made much deeper and slightly longer, the whole assembly was given more modern square lines and had a 2 h.p. 950 r.p.m. motor mounted on its left-hand side to drive the table feeds and rapids (a change in design also made at around the same time by many competing manufactures in America and Europe). Installation of the motor removed the need for a complex drive from the spindle motor and so considerably simplified the machine, reduced manufacturing costs and improved reliability. Table sizes were, surprisingly, slightly reduce with that on the Plain machine being 51" x 12.75" and on the Universal 51" x 11.5". However, although across and vertical travels remained unchanged at 10" and 18" respectively, longitudinal was increased by 2" to become 30" on the Plain model and 28" on the Universal. As before, twelve rates of table feed were fitted: longitudinally and in traverse from 0.5 to 10.5 inches per minute and at half that rate vertically. Rapid feed for both horizontal movements was at the rate of 100 inches per minute - and 50 inches vertically. The final years of No. 2N production saw few changes in mechanical design - the table sizes, feeds and spindle speeds all remaining unchanged. However, some effort was made to update the machine and customers could order electrical push-button control of the longitudinal feed as well as electrical trips in addition to mechanical ones. Also available was a system that gave automatic and semi-automatic cycles for production work with the Rapids (actuated by mechanical stops on auto-cycle work) engaged through electro-magnetic clutches. 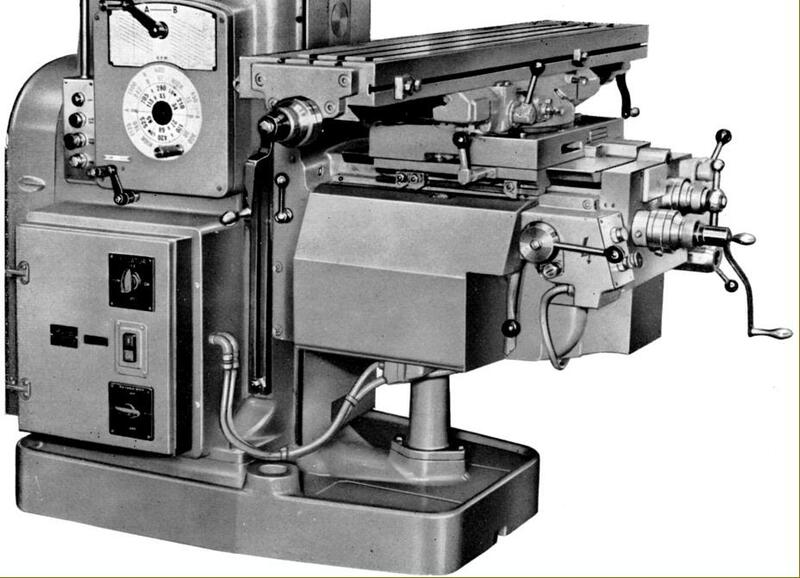 As might be expected of a machine tool from this era, in addition to feed-screw micrometer dials the machine could be fitted with either an optical measuring system (from several makers) or one of the new 3-axis digital readouts. The vertical model could, in order to provide a 3-axis autocyle facility, be fitted with hydraulic rise and fall to the table. The standard, hand-controlled vertical was sold as the 2V/1, with auto-table control as the 2V/2, with the optional hydraulic table rise and fall as the 2V/2?RF and as the 2V/23 when equipped with a 70PBT plugboard controller. The latter system gave full 3-axis control with the board incorporating 20 steps - with the facility of being able to programme 3 axes in one step to give a total of 60 stages. Table traverses were controlled by pre-set dogs mounted on interchangeable trip bars, the positioning accuracy of the system being repeatable to within ±0.001". Manual control of all feeds on this version was by push buttons mounted on the plugboard unit. 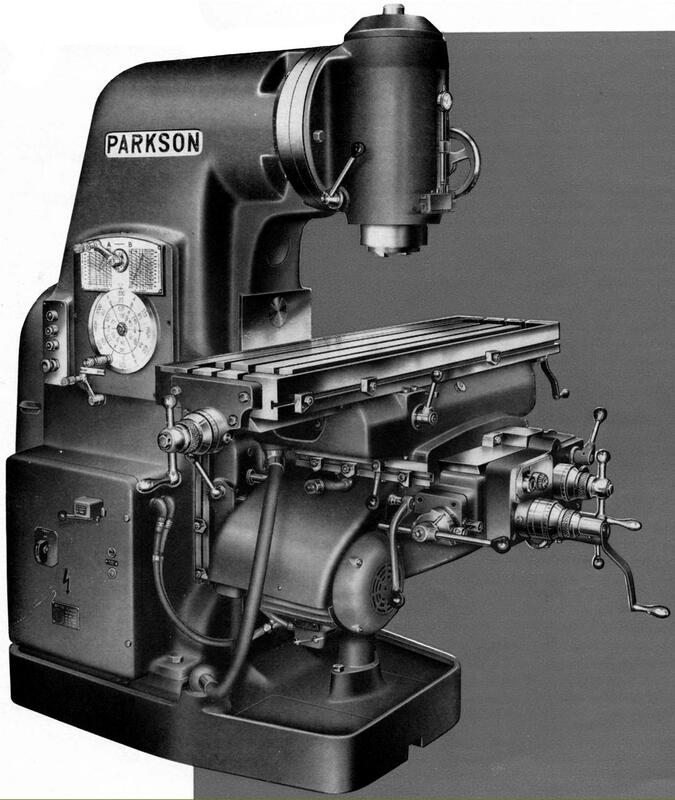 In common with other established makers of conventional milling machines including the much larger American maker Cincinnati and the Italian Riva Company, Parkinson offered a wide range of useful attachments. In addition to the expected range of rotary tables - and the previously mentioned universal dividing attachment - these included a range of heads to convert the horizontal models into simple vertical millers or to perform such specialised tasks as rack and gear cutting. The standard vertical head was made in two versions, the Standard (with a No. 40 nose) and the Heavy (with a No. 50 nose). Each was bolted to the inside face of the column and also supported, for extra rigidity, by the dovetail slides of the overarm. 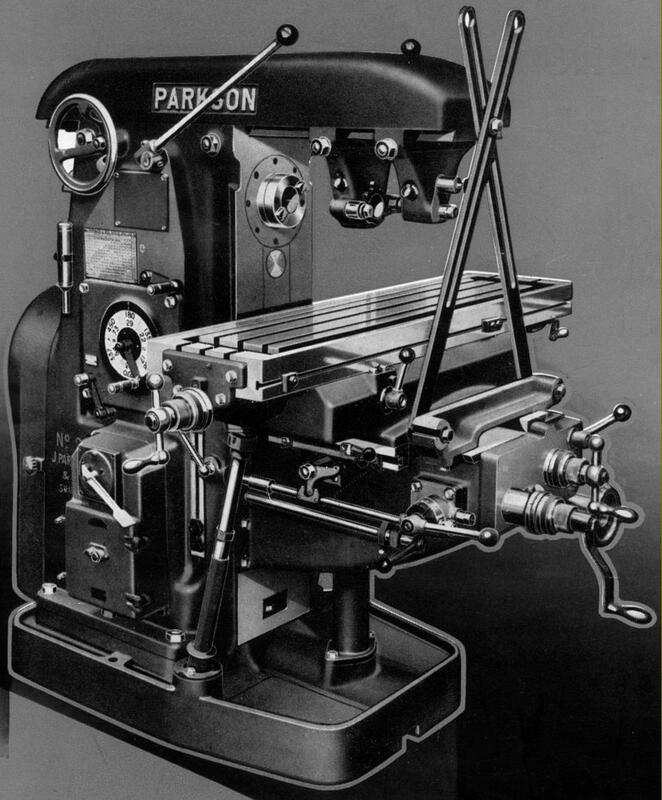 Driven by the horizontal spindle, unlike similar heads offered by many other makers those supplied for Parkson millers included internal gearing to increase spindle speeds - the Standard doubling them and the Heavy increasing them by 25%. Unfortunately neither head was equipped with any form of quill feed. Another, more complete solution to vertical machining was a special overarm the Style L Motor-Driven Universal Milling Head. Able to be used in place of the ordinary unit to support horizontal cutter arbors, the Style L carried a 2 h.p. 1450 r.p.m. motor that drove a gearbox to give a range of 16 speeds: 44, 71, 98, 112, 158, 170, 210, 250, 340, 378, 466, 540, 750, 815, 1200 and 1800 r.p.m. Final drive was by spiral bevel gears with the transmission spurs gears heat-treated, profile ground and lubricated by splash from a sump provided with a level glass. The end of the assembly carried a double-swivel head with the No. 40 taper spindle running in taper roller bearings and held in a 3-inch travel quill. Early versions of the overarm were fitted with a fine-feed handwheel that was not only awkwardly positioned but tricky to operate, being concentric with the spindle and moving the quill though a screw and nut. Later, this arrangement was completely redesigned to include a handwheel working through worm and wheel gearing with, as an extra-cost option, the addition of a quick-action lever feed. A useful device for special work was the Short Lead and Feed Reducer. Bolted to the end of table (shortening the travel by around 6 inches) the device contained gears with a 20 : 1 reduction that coupled to the table feed screw. The operator was thus able to move the table with great precision, if rather slowly. However, its main use was in conjunction with a power-driven dividing head, when it allowed screw threads or spirals of short single or multiple lead to be milled when the spindle had to make a complete revolution during a relatively short longitudinal movement of the table (so making the speed of cut far too high). By providing a very slow rate of table travel (the spindle, connected by changewheels to the feed screw still rotated at the same speed) it became possible to mill threads and spirals that would otherwise have been unobtainable - the intended range of leads being between 0.1 and 2 inches (note: the term "lead" is the distance a screw advances when tuned through one revolution. For an ordinary, single thread, lead is the same as the pitch (the t.p.i. or threads per inch) while for a two-start thread the lead becomes twice the pitch, and for a three-start three times the pitch. e.g. a single-start 10 t.p.i. thread advances 0.1" per turn; with a two-start thread it would advance 0.2" and with a three-starts 0.3")..